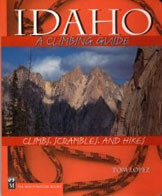 The route description is found on page 274 of the Climbing Guide. Here is Bob’s trip report of their experience. During late September 1976, Frank Florence and I attempted this face but were turned back by a torrential rain storm that lasted for our entire trip. On the way out, we were lucky to find a way across Rock Creek because the creek had risen nearly 3 feet overnight. Due to the cloud cover we never got a good look above the first cliff band. All we saw was snow so we figured this face would be no more challenging than a Sawtooth snow climb. 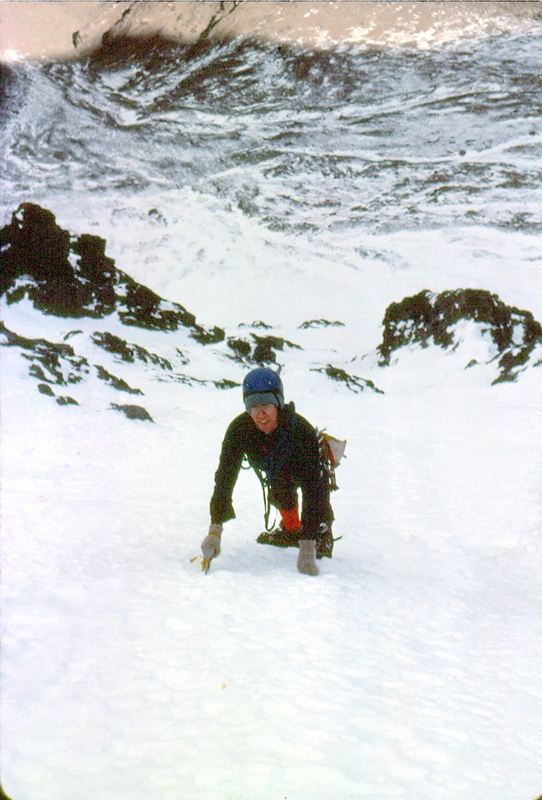 Mike “frenching” on hard ice on the lower North Face of Mount Borah. Photo – Bob Boyles. 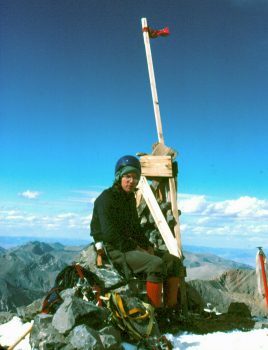 Four weeks later Mike Weber and I went back with a 50-ft piece of salvaged rope, a couple of biners and a few nuts, figuring this climb was going to be a piece of cake. We hiked up Rock Creek and set our camp in the trees well below the first rock band. Early the next morning we took off for the face. 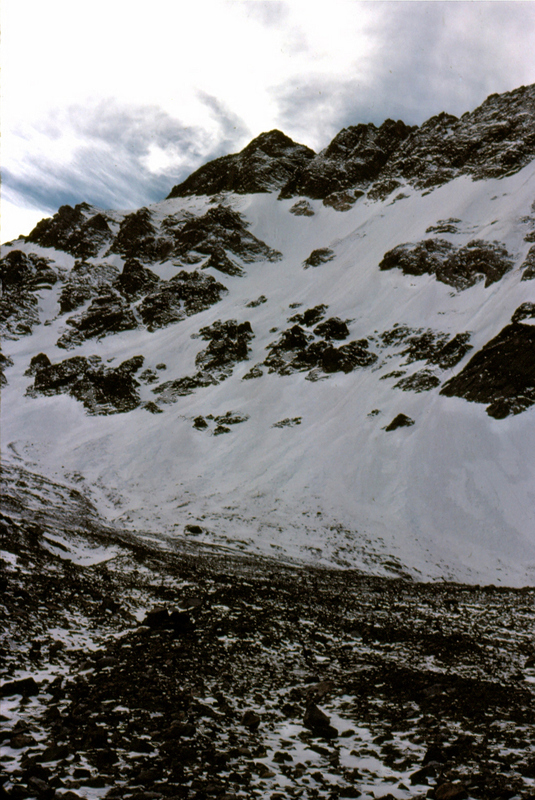 We were above the cliff and on to the lower moraine before we saw that the entire face was glistening with hard ice and a dusting of new snow. 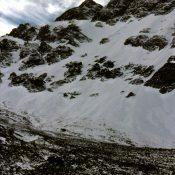 The heavy rain in September had stripped away all of the past winter’s snow leaving a totally buffed out 2,000-ft face of pure alpine ice. At the top of the moraine we stepped on to hard ice and didn’t get off our points until we got into the sun just below the summit. 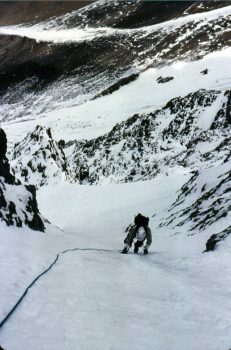 Although it was hard ice, we didn’t rope until the ice steepened to around 55 degrees at the bottom of the final couloir. At that point, we finally admitted to ourselves that a slip up here was going to be unstoppable with an arrest. 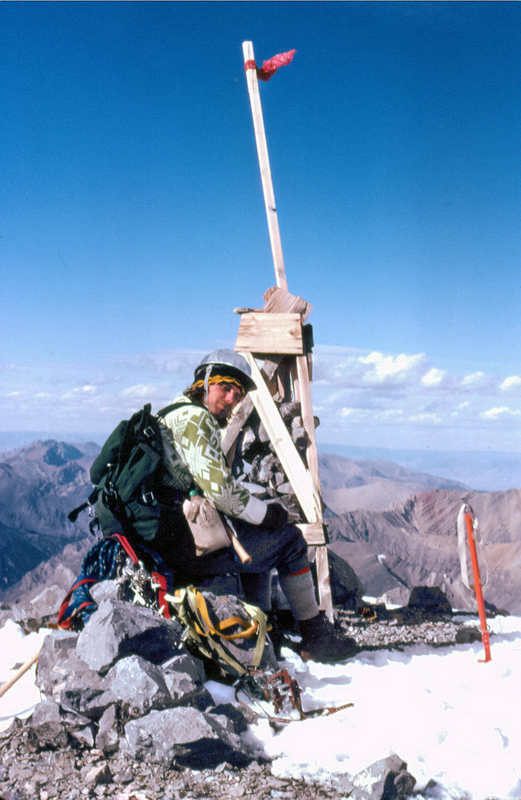 We were happy to make the summit, but then we realized our mistake: we had left our gear at Rock Creek. Now we had to go back down to where we started and it was getting late. 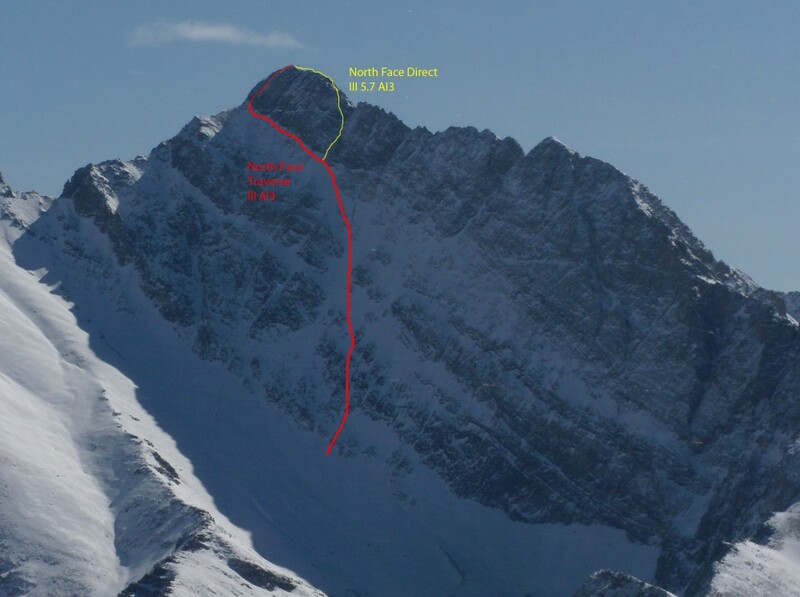 Descending the standard route, Chicken Out Ridge, and walking back up Rock Creek in the dark didn’t sound appealing at all so we descended the East Ridge until we found a ledge that runs across the top of the East Face to the Northeast Ridge. 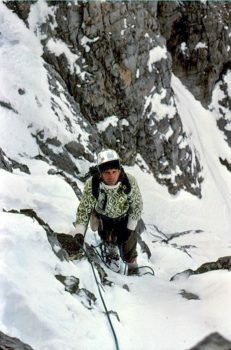 As we were poking around the top of the steep couloirs looking for the shortest way down, I stepped on a patch of snow covered ice and took off (standing) like a ski jumper on a ramp and slid maybe 20 feet to a quick stop on a tiny patch of bare rock. We both froze in our respective spots and immediately put our crampons back on. (It was one of those moments as a climber that you don’t think about much at the time, but you will later, trust me.) 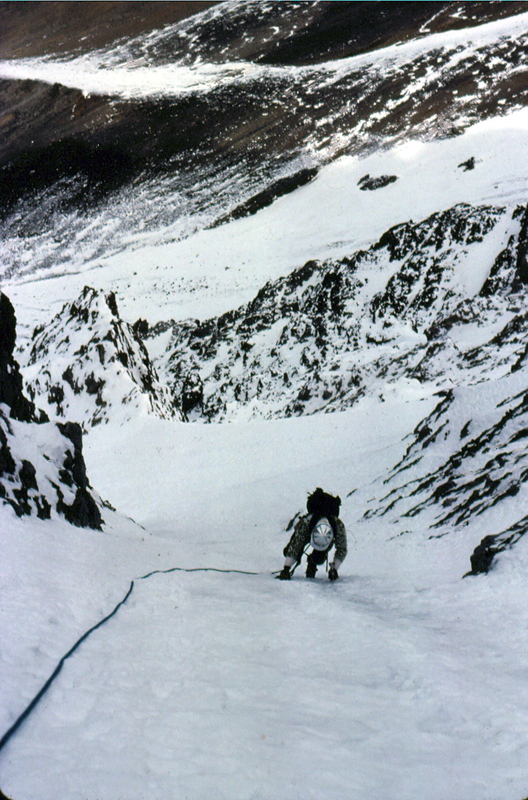 From there, we turned down the hidden, upper most couloir of the North Face and front-pointed down ice that was steeper than anything we found on the main face. 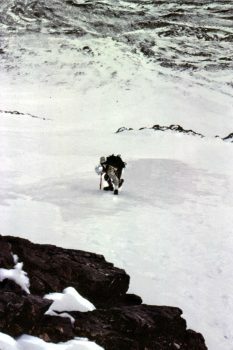 We eventually made it out to the sweeping slope that descends to the morraine. The ice was so hard that even the lowest-angled ice was impossible to walk on, so we had to wear crampons until we reached bare rock. Just as we got off the moraine and down the big cliff band, it turned pitch dark. In the dark we were “temporarily misdirected” (i.e., totally lost but not willing to admit it). We wandered up and down the valley for almost 3 hours before we finally found our camp and belatedly celebrated our first ascent.